Please briefly describe your research. I am evaluating canola meal, a by-product of canola oil production, as a protein source for dairy cattle. Specifically, I am investigating the physiological and production responses of cows as they transition from pregnancy to lactation when canola meal is a primary protein source in the ration. Why did you choose to attend UW-Madison for graduate study? 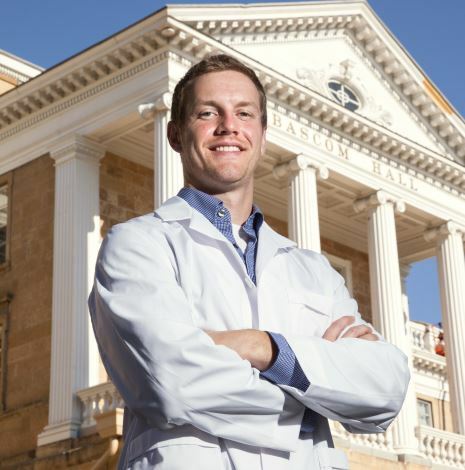 The University of Wisconsin-Madison has the top dairy science program in the country, with a world-renowned faculty. The opportunity to study with this faculty was very instrumental in my decision to pursue my education at UW-Madison. In addition, the breadth of courses available here has allowed me to focus my education to best prepare me for my future career. What resources have proven invaluable to your academic success at UW? I cannot say enough about the on-farm support, the dynamic facilities, and technology available for conducting animal research studies. Also, the outstanding staff and student network serve as a tremendous support system to make research successful. In your own words, how would you describe the academic environment at UW? It is truly exciting to be part of the academic environment at UW-Madison. There are talented people all across campus, pursuing fascinating discoveries in all disciplines. To meet and work with these people through coursework, seminars, and cross-disciplinary research is a tremendous opportunity. Engaging in discussion with these world-class academics opens your mind to new possibilities and fosters the pursuit of new knowledge. This is one of my favorite aspects of graduate study at UW-Madison. What are your post-graduation plans? After completing my degree, I hope to work alongside dairy farmers in a nutrition consulting role. I grew up on a small dairy farm in Wisconsin where I came to appreciate the people and farms that make up our great industry. I look forward to doing what I can to help dairy farm families succeed. This entry was posted in Blog by tjhalbach. Bookmark the permalink.